Fall Garden harvest is NOW! 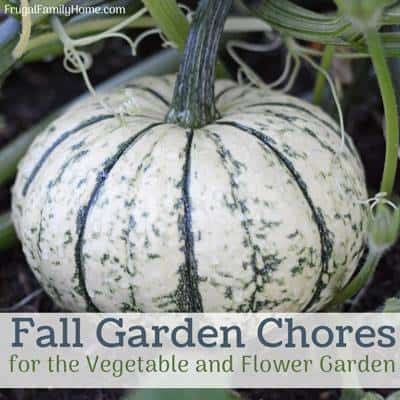 Is it also Time to get out your Fall Garden chore list and prep the garden for next spring? 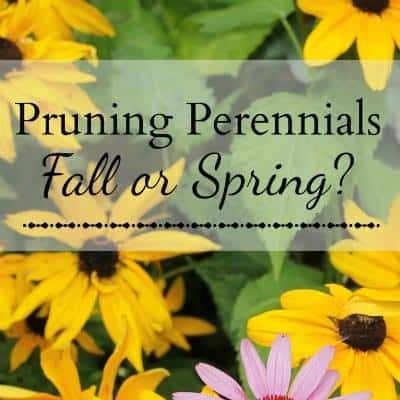 …OR…Can you continue the growing season into late fall with cold hardy plants? Even plan a winter garden and harvest certain cold hardy plants clear through til Spring if you are lucky? Yes you can! I’m sharing tips for extending the garden growing season into late Fall. 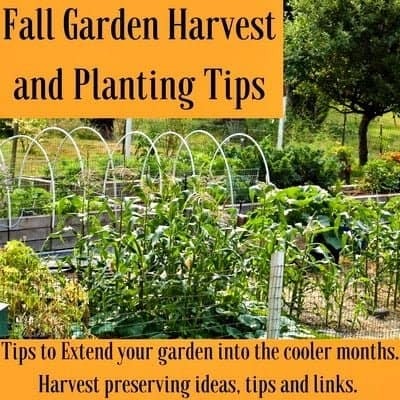 I’ve also put together some tips and ideas to use up your lovely Fall garden harvest too. Our Tuesday in the Garden Blog Hop is back for another week. Our group is sharing ideas on the Fall garden this week. 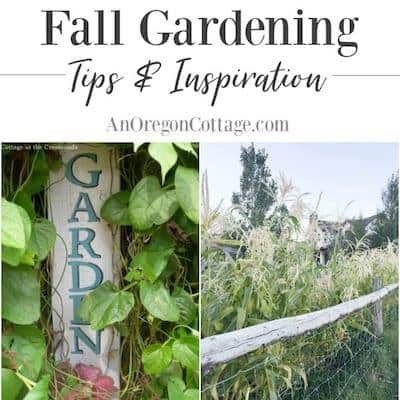 Please click on each post link at the bottom of this article for more clever ideas on Fall gardening. Harvest time is starting now. My counters are filling up with produce I need to make into food or put by for winter. Read on for some of my favorite methods of preserving the garden harvest. Dave planted lots of color in the garden this year. Purple beans and red fingerling potatoes and rainbow carrots brighten up a meal. 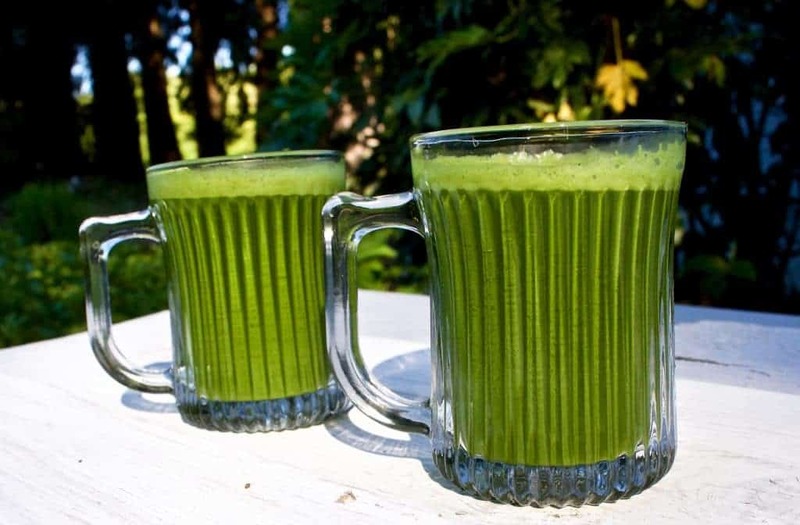 Plant cool weather seeds in July and August to reap a crop of greens for juicing and salads into November. With some luck, and hoop gardening in raised beds, the tough cold hardy crops can last long past the first frost into deep Winter and even through to next spring. Are you looking to Extend a summer garden into the cooler Fall months? Check your local USDA garden zone and then find out which crops are your best choice for Fall planting. You will need to get your Fall crops mature before your first frost date. So choose your crops by date to maturity. Once the temperatures drop your crops will stop maturing. 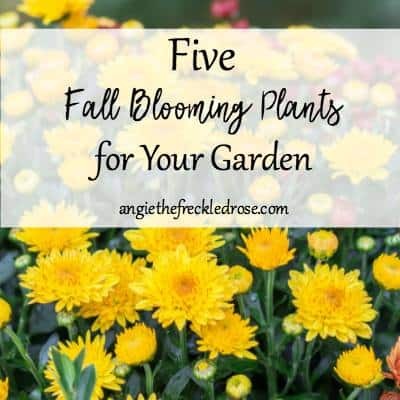 If you want to a late Fall garden harvest plant now! Your crops need to be mature by the first frost date in your area. As the temperatures cool the plants grow more slowly and need time to mature before severe weather hits. Look for crops that are cold hardy and mature in time. Farmers markets usually have good organic plant starts. They normally carry varieties that grow well in local gardens. Use Cold frames to protect young seedlings and plants from cold night temperatures (below 50 degrees F.). Remove the frames (or open them) during the warm daytime hours to avoid burning your plants. 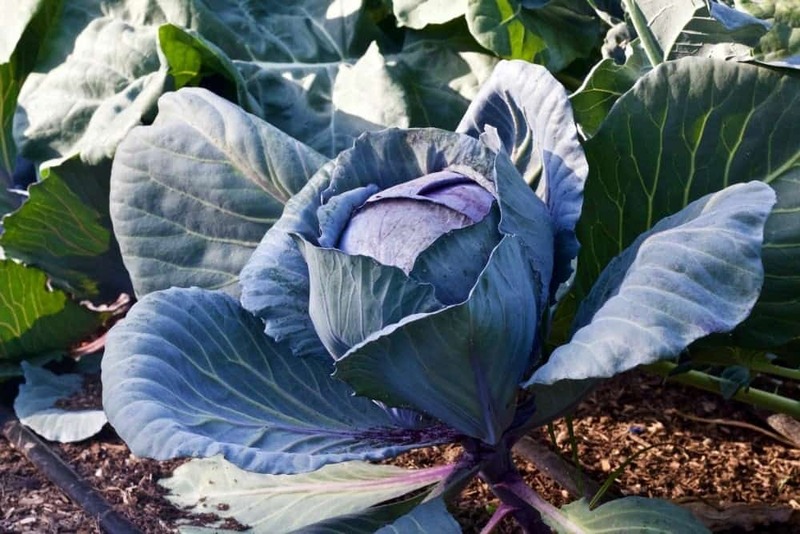 As you harvest summer crops, renew the bare garden bed with a small amount of compost or organic fertilizer and plant a cold hardy crop in that area. Water Water Water! The ground is dry way down deep this time of year. You will need to water often and deeply to get new crops started and flourishing and keep your summer crops prime. Continue weeding and working up the soil in areas you wish to replant. No room in the garden? Fall crops can be planted in containers if you have large ones, Like [easyazon_link identifier=”B00FGQ4YSC” locale=”US” tag=”homefoodjunk-20″]half barrels[/easyazon_link]. Now is the time to get into the garden and plan and build for a winter hoop garden. Make your hoops for the crop covers. These can double as cold frames through the Fall cool nights too. Once set up these garden beds and hoops are handy year round. 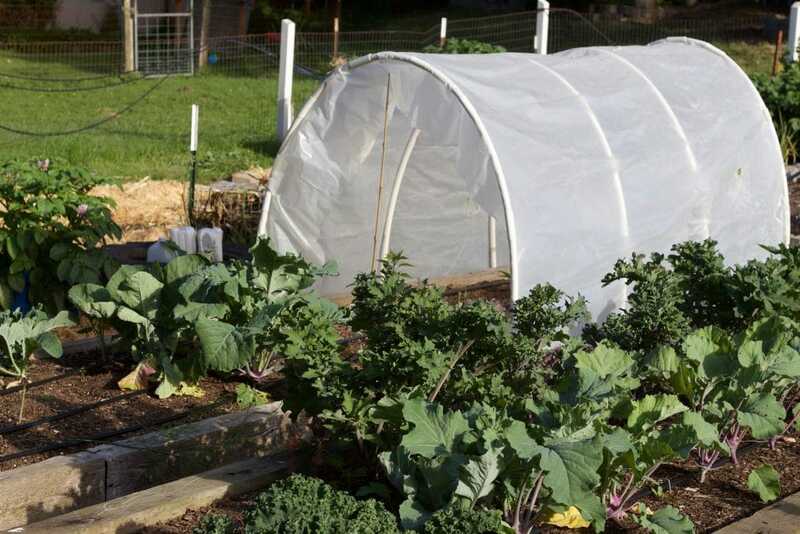 Hoop Gardening protects the crops from temperature extremes and helps extend the growing season. Are you a hobby gardener enjoying fresh produce you can occasionally pluck out of your garden and use at table? Or do you feed your family all year off the proceeds of your garden? We are somewhere in between now. When the kids were little I canned, dried, froze and juiced garden goods to last us the winter. It’s much easier now with fewer people to feed. Regardless of your family needs, prime garden produce is worth protecting and correctly managing so you enjoy the fruits of your labor at it’s best. Gardening is a challenging, creative pursuit and a fun hobby if you love good food. Our Red Cabbage is going into sauerkraut this year. Dave is tracking down a family recipe for us. It’s frustrating to get to the end of the season and realize your crops are buried under weeds and dead or scrawny from neglect. That was me. Dave is a MUCH better garden manager. Keep your garden well managed and the harvest will be amazing! Harvest summer crops daily to enjoy them at their best and get them stored for winter at their prime. Make sure your produce is perfectly ripe before harvest. Wait for the sugar to fully come up for best flavor. Overripe produce is also problematic. Keep harvesting every day! It’s so easy to miss the ripe crops (like zucchini) hiding under large squash leaves. Ever tried to use a 20 lb zucchini? Not easy! 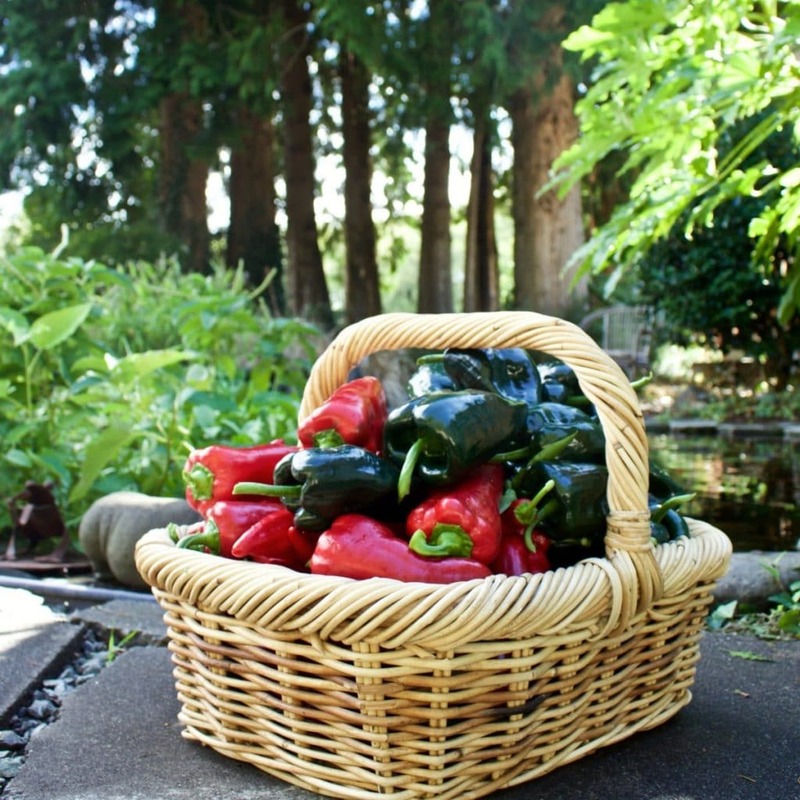 Garden peppers are good dried or roasted and stored in the freezer. Once your counters fill up with gorgeous vegetables what to do with the overflow? There are SO many ways to preserve food. It’s a good idea to get informed on which methods are out there. Decide which methods work best for you. Ask your friends and family to borrow expensive preserving tools (like vacuum sealers, food dryers and steam juicers). Do not wait til harvest to try to borrow or buy your needed supplies and equipment. I have run into trouble a few times looking for canning lids and jars deep into harvest season, for example. Be prepared and stock up before what you need is sold out. Root cellaring, freezing and canning all take some planning. Time to get thinking through storage needs of harvested crops. 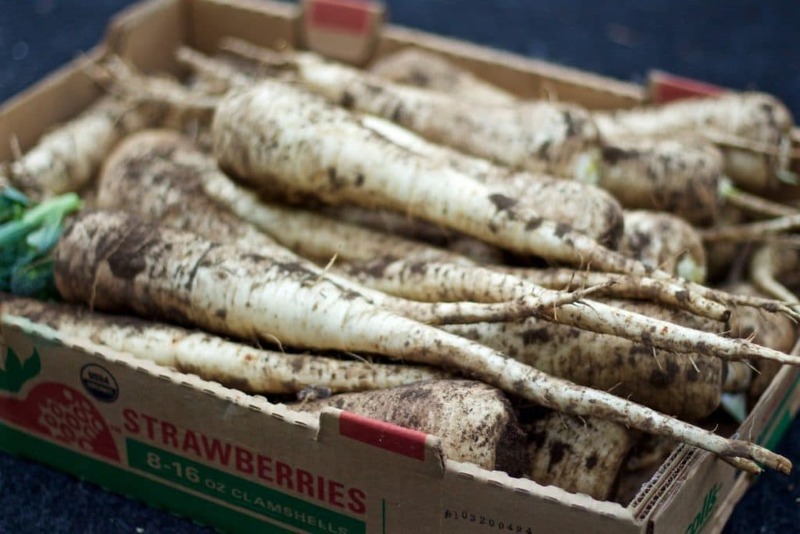 parsnips winter well in the garden but can be stored in cold storage too. Look for community groups of master gardeners and food preservers. 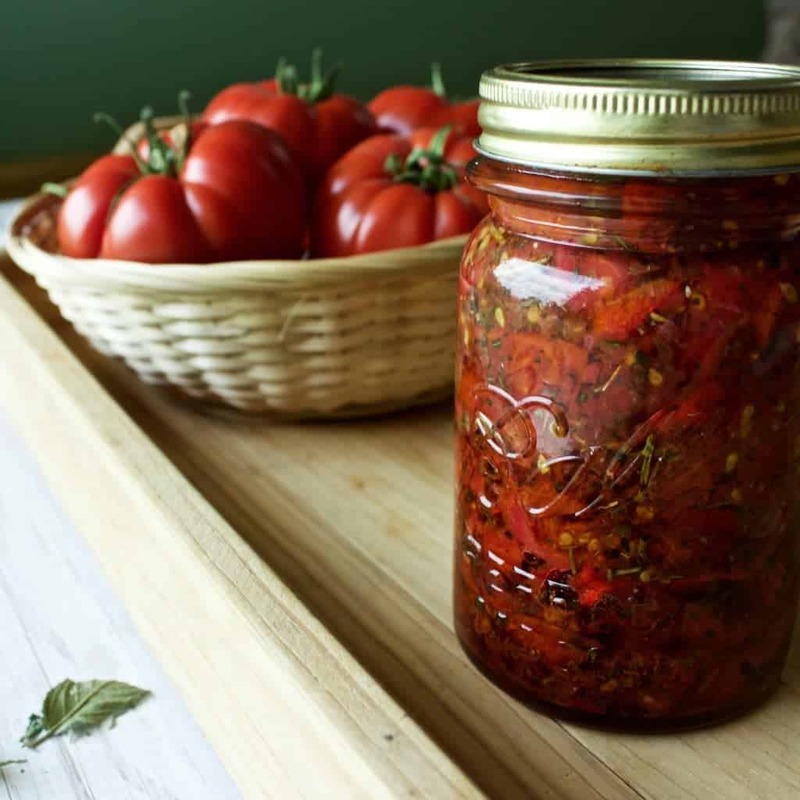 The National Center For Food Preservation is a good resource for home gardeners and also look for your local cooperative extension service for local help with gardening and meet local gardeners. The local library will have books on harvesting and preserving. Some of the local extension offices have list of food preservers who loan equipment and help you learn how to use it. Maybe even classes. Here’s some ideas and posts to whet your appetite on ways to put your harvest to work for you. [easyazon_link identifier=”B0090WOCN0″ locale=”US” tag=”homefoodjunk-20″] Food driers [/easyazon_link] last for decades and more than pay back over time in my experience. These ideas barely scratch the surface of food drying fun. Homemade Sun Dried Tomatoes One of my VERY favorite ways to put up tomatoes. Drying tomatoes concentrates the flavor and WOW they are good. I store my dried tomatoes in the freezer. Then when I’m ready for sun dried tomatoes I make a batch and store it in the fridge for several weeks. So good! 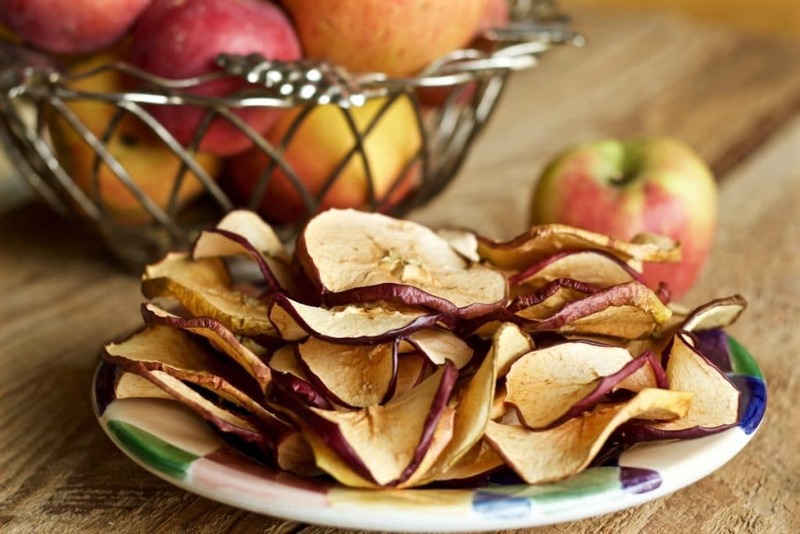 Homemade Apple Chips are another way to use your food dryer and make your family a delicious Fall treat or lunch box snack. Peppers- I do not have a post up about drying peppers yet. But I do dry them and they turn out great and last forever in the freezer. So handy for crunching up in soups and recipes. Dry them Whole or chopped. Green Juicing with a juicing machine (I use this [easyazon_link identifier=”B00434JINO” locale=”US” tag=”homefoodjunk-20″]Omega juicer[/easyazon_link]) is a fantastic way to use up a LOT of produce in a hurry. If your counters get full of this N that from the garden, get out the juicer! 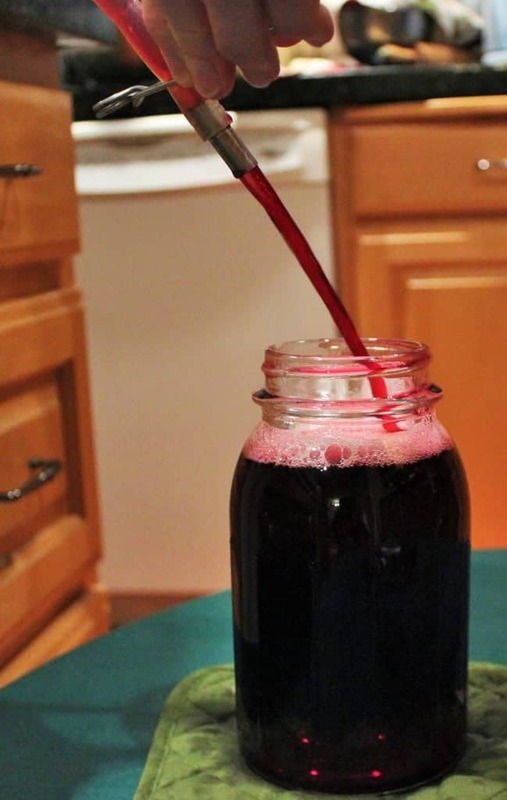 Homemade Grape Juice-you can make endless juices with a steam juicer. I love pear-apple, grape with pear or apple, and other fruit blends. No extra sugar is necessary if you use ripe fruit. Water bath the jars for the safest sealing method. These juices last all year on the shelf at room temperature. I freeze a lot of our produce. it’s easy, convenient and does a good job of retaining nutrients. Here are my posts on freezing. I prefer to use a [easyazon_link identifier=”B0001UZL8A” locale=”US” tag=”homefoodjunk-20″] water bath canner [/easyazon_link] for a few recipes we enjoy like Pepper Jam , Grape Juice and my Homemade Salsas. I no longer own a pressure canner. Freezing is my prefered method for preserving vegetables now. My Affiliate links are full of equipment ideas that will save you oodles of time and give you high quality product for your labors. I Highly recommend the book I linked. I have used it for decades! It has safest practice info on every preserving method I have ever heard of. If you purchase items through my affiliate links I may receive a small commision at no extra charge to you. Thank you for supporting Homemade Food Junkie! Hi Michelle, I told my husband he is a garden star 🙂 He likes that. We have worked hard to organize the garden and get the weeds controlled. That just takes so much time we do not have. I notice you have those handy raised beds. See if you can get Dan to lay landscape fabric between the beds and put a good load of gravel on the paths. That make SUCH a difference in the weeds. Good luck! I am super excited for fall planting, harvesting, prep and cleaning this year! 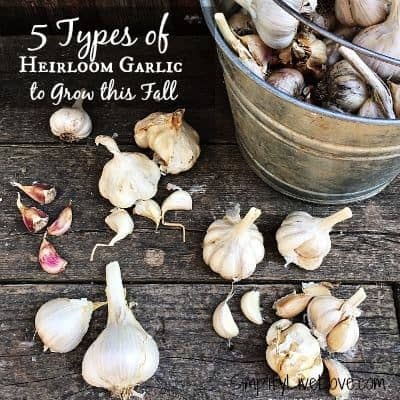 You have really put the ultimate guide together here 🙂 I love the idea of having a root cellar. 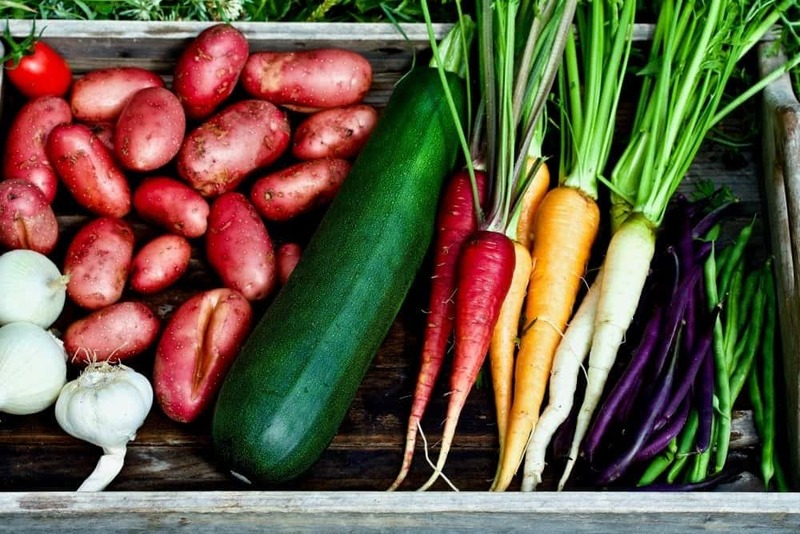 That harvest picture, filled with a rainbow of veggies is just beautiful. Happy almost fall! Hi Angie, Thanks and I hope you enjoy the changing season as well! We are delighted to help you get started with gardening. Be sure to check out our Lasagna gardening Post to help you get set up for next spring. Happy Gardening! I just love looking at your neat and tidy garden, Diane! I wish Brian was as interested as your Dave in keeping a garden, but sadly it’s just me (he’ll do the heavy work,though, so I’m grateful for that!) so yes, I hear about the getting out of control! If it’s a choice between processing tomatoes that may go bad or watering & weeding – well you can imagine what can happen. 🙂 Thanks for so many tips! Hi Jamie, Dave picked up the gardening bug just this last five years or so. Before that I did all the work. I think he just decided he needed the garden ship shape. Believe me I’m grateful. He has made gardening so much better for us! And yes, preserving produce is WAY above weeding. That’s what happened to me every year too. Frustrating! I really wanted to get hoop houses set up for our garden for this fall. But I don’t think it will happen this year. Too many other projects but I’m hoping to get a few cold hardy items into the garden for fall and early winter harvesting. If we have a mild winter they should do pretty well. Thanks for all the tips. Hi Shelly, We are buried this year too. Our summer garden may be all we get this time. Hoops are a really great way to make a winter home for veggies. Maybe next year! Wow! This is packed with so much good information. Even though I don’t grow a lot of edibles I can really appreciate so many of your tips. One of these days I’m going to hop on the edible train and I’ll know just where to go to for great information. Thank you Patti, I see a vegetable garden in your future. Once you get a taste of it, you’ll be hooked!